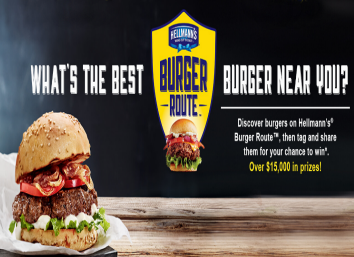 Hellmann’s Burger Route Sweepstakes – Win a gas grill or other great prizes! Win a gas grill or other great prizes! ENTER SWEEPSTAKES HERE – Hellmann’s Sweepstakes page. To enter without making a purchase or submitting a photo: If you would like to enter the Sweepstakes without purchasing a burger, you may enter via Twitter.com by sharing the Burger Route Sweepstakes Website (BurgerRoute.com, hellmanns.com/burgerroute or bestfoods.com/burgerroute) with the hashtag #BurgerRouteContest and tagging either @Hellmanns [twitter.com] or @BestFoods [twitter.com] to receive one (1) entry into the corresponding monthly and weekly random drawings only. Sweepstakes Entry must include the hashtag to be eligible and must be 140 characters or less including the hashtag and tag if entering via Twitter (without a burger photo). ENTRY LIMIT – There is a limit of one (1) Sweepstakes Entry per person per day, regardless of method of Sweepstakes Entry. SWEEPSTAKES ENTRY PERIOD – The Burger Route Sweepstakes begins April 7, 2016 at 12:00 a.m. Eastern Time (“ET”) and ends December 31, 2016 at 12:00 p.m. ET. PRIZES – Month 1 Grand Prize (1): A Sponsor-selected gas grill (ARV: $500). Month 2 Grand Prize (1): A Sponsor-selected tablet PC (ARV: $500). Month 3 Grand Prize (1): A Sponsor-selected charcoal smoker (ARV: $500). Month 4 Grand Prize (1): A Sponsor-selected cooler (ARV: $500). Month 5 Grand Prize (1): A Sponsor-selected smart watch (ARV: $400). Month 6 Grand Prize (1): A Sponsor-selected tablet PC (ARV: $500). Month 7 Grand Prize (1): A Sponsor-selected gas grill (ARV: $500). Month 8 Grand Prize (1): A Sponsor-selected tablet PC (ARV: $500). Month 9 Grand Prize (1): A Sponsor-selected charcoal smoker (ARV: $500). and Weekly First Prize 5 (7 total): A $100 Burger Route gift card. Weekly Second Prizes (76 total, 2 per week): A $50 Sponsor-selected shopping gift card. Weekly Third Prizes (304 total, 8 per week): A $25 Sponsor-selected music gift card.